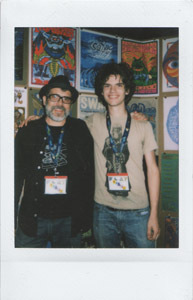 monkeyink:blog: Flatstock 33 SXSW Austin was great! It was inspiring to talk with many many people in Austin! Flatstock 33 at SXSW It's great to get your paradigm rocked by spending a few days in a massive room full of endless amazing poster art, and the conversations that ensue. Thanks to my pal Kyle Carter for all the help. Awesome event. <- instant cameras are back! Instax person, thanks!